Angelique Kerber takes on Madison Brengle in the second round of the Brisbane International. Varvara Lepchenko takes on Garbiñe Muguruza in the second round of the Brisbane International. SHENZHEN, China – A day after making a winning comeback to the tennis court at the Shenzhen Open, Eugenie Bouchard backed it up to reach her first WTA quarterfinal in almost a year. Watch live action from Brisbane, Shenzhen & Auckland on WTA Live powered by TennisTV! On Tuesday, Bouchard played her first complete match since suffering her concussion at the US Open, and she was a winner, rallying from 4-2 down in the third set to edge Donna Vekic, 6-4, 1-6, 7-5. The No.6-seeded Canadian had a much simpler day at the office on Wednesday, dropping serve in the first game of the match but then reeling off 12 of the next 17 games to roll past American qualifier Nicole Gibbs, 6-4, 6-2, breaking serve one last time to win after just 67 minutes on the court. “It was a solid match from me. 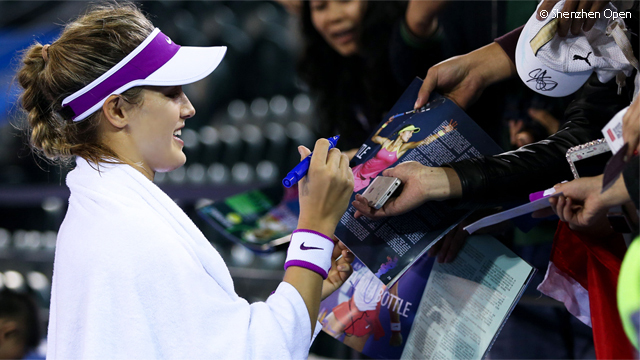 I think I was able to improve off of my first round,” Bouchard said. Bouchard is now through to her first WTA quarterfinal since last year’s Australian Open. And the Canadian, a former World No.5 and Wimbledon finalist, doesn’t want to stop here. “Every match that I play gives me a little bit more confidence,” she said. “I know it’s a long road back to recovery and to being back to where I was and even better, so I’m ready for that long journey. The tournament’s No.1 seed, Agnieszka Radwanska, followed Bouchard onto center court – and into the quarterfinals as well – after a close finish, closing out China’s own Zhang Shuai, 6-1, 7-5. Radwanska, who’s coming off a fantastic fall season that brought her three WTA titles – including the WTA Finals in Singapore – and took her back to World No.5, has now won 19 of her last 23 matches. It was a rough day for the other seeds in action, though, with No.3 seed Irina-Camelia Begu retiring down 7-5, 3-2 to Anna-Lena Friedsam due to a right knee injury, No.4 seed Monica Niculescu falling to Timea Babos, 6-1, 6-4, and No.7 seed Zarina Diyas succumbing to Katerina Siniakova, 6-0, 6-4. An interview with Angelique Kerber after her second round win at the Brisbane International. BRISBANE, Australia – Victoria Azarenka survived some tense moments early on but then absolutely powered through to the quarterfinals of the $1,000,000 Brisbane International on Wednesday. Facing unheralded lucky loser Ysaline Bonaventure, who replaced Simona Halep in the draw, Azarenka had some trouble early on – she dropped serve in the opening game and then, a few games later, had to battle for more than 16 minutes to break back, but she eventually did, evening it to 2-all. From there the Belarusian ruthlessly powered past the Belgian, reeling off 10 of the next 13 games – and winning 12 of the last 13 points of the match – to prevail in an hour and 27 minutes, 6-3, 6-2. 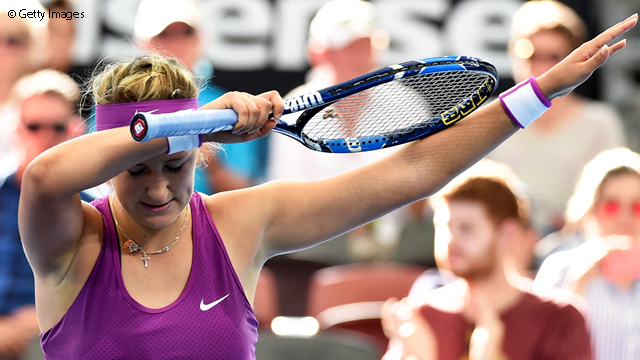 “I think the beginning was definitely really tough,” Azarenka said after the match. “She played very well, and it’s also a little bit of a moment of adaptation when you don’t know who you’re playing. But I’m glad I could stay strong and turn it around at the beginning. It wasn’t going my way at first, for sure. Awaiting Azarenka in the quarters will be No.8 seed Roberta Vinci, who won through on Tuesday. Azarenka has beaten Vinci in straight sets in all three of their previous meetings, but they haven’t played since 2012, and Vinci is on fire – she’s gone from No.43 to No.15 in the last four months. Three more players snapped up quarterfinal berths at the Premier-level event during the day session, most notably No.4 seed Angelique Kerber, who cruised past Madison Brengle in 61 minutes, 6-3, 6-0. Other winners were Andrea Petkovic, who edged fellow former Top 10 player Ekaterina Makarova, 7-5, 6-4, and American qualifier Samantha Crawford, who surprised No.7 seed Belinda Bencic, 7-5, 7-5. Crawford – who hit 13 aces in the match – didn’t just score her first Top 20 win over the No.14-ranked Bencic, it was actually her first Top 50 win (she had never beaten anyone higher than No.59 before). Sunday was a complete rain-out at the Shenzhen Open, but WTA stars like Agnieszka Radwanska were still bringing smiles to the faces of the fans. See how they did it here. 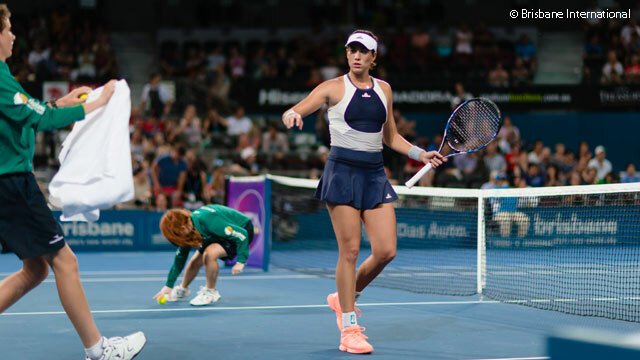 BRISBANE, Australia – No.2 seed Garbiñe Muguruza became the latest casualty at the Brisbane International when she was forced to retire from her second round meeting with Varvara Lepchenko on Wednesday evening. Watch live action from Brisbane & Auckland on WTA Live powered by TennisTV! Following on from the last-minute withdrawals of Maria Sharapova and Simona Halep, the path to the title lay wide open, but Muguruza saw her chance of silverware scuppered when she aggravated a long-standing foot injury. Visibly struggling for the remainder of the set, in which she coughed up 27 unforced errors, Muguruza played through the pain barrier, fending off four set points before finally succumbing in a tense tie-break. Despite lengthy treatment during the changeover, it was quickly apparent that her resistance would not last much longer, admitting defeat after Lepchenko held serve the following game. The Spaniard remains optimistic that the injury, which she carried over from the previous campaign, will not jeopardize her chances at the upcoming Australian Open. “Last year I felt it almost during the whole season. I felt it also in the pre-season a little bit, but especially here over the last few days, playing points, running more, more, more,” she said. Meeting Lepchenko, who had been leading 7-6(9), 1-0, for a place in the semifinals will be Muguruza’s doubles partner and fellow Spaniard, Carla Suárez Navarro. “Carla’s a very tough opponent and she’s playing well so I’m expecting the best from her and I’ll have to fight for every ball,” Lepchenko said. An interview with Simona Halep after her withdrawal from her second round match at the Brisbane International. 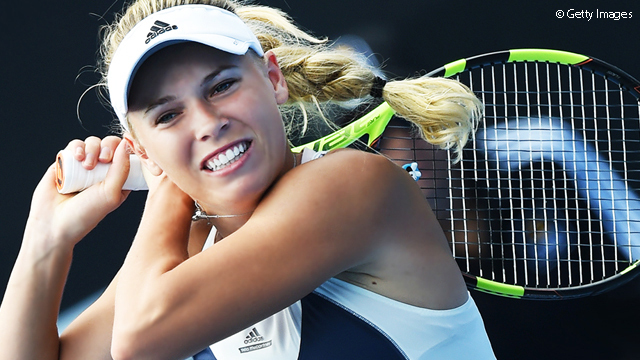 AUCKLAND, New Zealand – Caroline Wozniacki took tournament favorite to a whole new level at the ASB Classic on Wednesday night, dropping just two games to round out the quarterfinal line-up. The highest seed left after No.1 seed Venus Williams and No.2 seed Ana Ivanovic both succumbed to inspired underdogs on Tuesday, the No.3-seeded Wozniacki powered through to the quarterfinals of the International-level tournament with a ruthless 6-0, 6-2 victory against Christina McHale. And what worked so well for the two-time US Open finalist and former World No.1? Two more of Wozniacki’s fellow seeds fell on Wednesday as well, with No.4 seed Svetlana Kuznetsova falling to Austrian qualifier – and two-time Wimbledon quarterfinalist – Tamira Paszek, 6-2, 6-3, and No.7 seed Barbora Strycova losing out to fellow former Top 20 player Julia Goerges, 6-4, 7-6(7). Sloane Stephens, the No.5 seed, managed to avoid the upset bug, though she did have a fight on her hands, rallying from a set down to outlast German up-and-comer Carina Witthoeft, 3-6, 6-1, 6-3. Other winners were Alexandra Dulgheru, Nao Hibino, Belgian qualifier Kirsten Flipkens and British qualifier Naomi Broady, who had the most dramatic victory of the day, rallying from 5-2 down in the second set and 5-1 down in the third set to edge Latvian wildcard Jelena Ostapenko, 4-6, 7-6(4), 7-5. Broady also saved two match points – one serving 2-5 second set, one serving 3-5 third set. The big-serving Brit, who had taken out Ivanovic a day before, rifled 21 aces against Ostapenko. An interview with Ekaterina Makarova after her win in the first round of the Brisbane International.